LEXINGTON, Ky. (Jan. 29, 2019) — Laura Schwab lives life in the fast lane — setting her sights on a goal and ultimately achieving it. When opportunities present themselves, rarely does she tap the brakes. That approach is what led the University of Kentucky alumna to the role of a lifetime — representing a company regarded as a cultural icon. You're probably familiar with Aston Martin — the luxury British car manufacturer commonly known for commanding box-office hits, such as "Goldfinger." On the big screen, James Bond is behind the wheel of the company's classic sports cars. Behind the scenes, Schwab is steering. 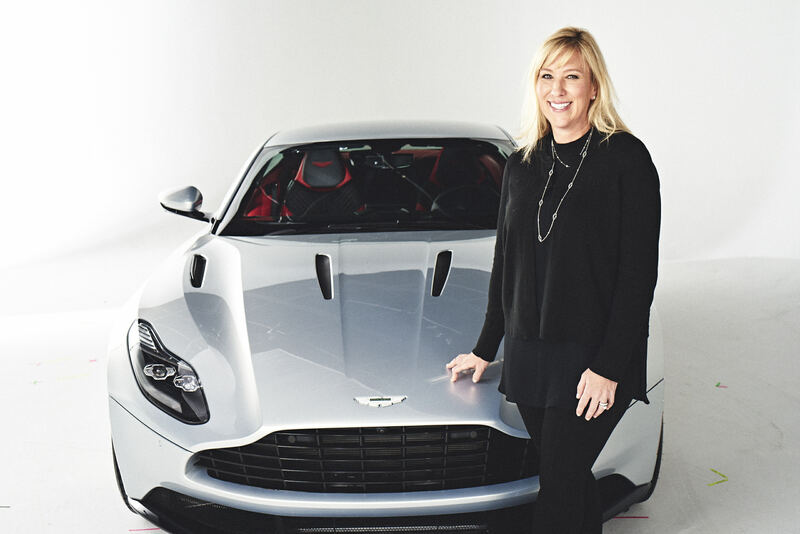 As head of Aston Martin the Americas, Schwab is the first female president in the company's 105-year history. She and Mary Barra, the CEO of General Motors, are the only two women to lead auto manufacturers in the male-dominated industry. "I treat this honor very seriously, as so many people love this brand," Schwab said. "I'm especially lucky to play a part in our tremendous history, as we embark on what we refer to as our 'Second Century.'" Growing up in Louisville, Schwab's interest in cars was practically nonexistent. In high school, her passion didn't extend far beyond dominating tennis. Schwab's athletic success continued. She went to University of Notre Dame on a full scholarship, eventually becoming captain of the tennis team. When confronted with life after sports, Schwab turned her focus to discovering a career path. She wasn’t clear on where to start, but figured law school was a logical next step. "Going to UK had always been a dream of mine. I knew there was no better law school for me." In 1998, Schwab graduated from the College of Law at UK. While most graduates are eager to enter their field, for Schwab, life after graduation wasn’t as well defined. Simply put, she realized practicing law wasn't for her. Yet, outside of the courtroom, her degree still had immense value. "Having a law degree from UK has helped me get every job I’ve ever had. It says a lot about a person, that they’ve worked hard enough to be admitted to law school and to have graduated. My law degree taught me how to think and be analytical, and how to build and present a case," Schwab continued. "UK was also the place I’ve made some of my best friends, many of whom are strong, intelligent women, each of whose impressive career paths has inspired me." Achieving her own success wouldn't be easy. After law school, Schwab traded the Bluegrass State for the Golden State. She was in search of a new adventure and a job that could pay the rent. During that time, a startup called Autofusion was among the first companies to have created an online marketplace for new and used cars, and they had an opening. "They asked me what I knew about the internet. I admitted, I didn’t know much but countered, 'I’m a fast learner.' They asked if I liked cars, and I responded with a resounding ‘yes.’ Before I got to the door, they offered me a small salary and a job, which I was thrilled to accept," Schwab said. "I’m convinced my law degree is why they hired me; it probably assured them that I was fairly smart and motivated enough to have earned a doctoral degree." As an employee at Autofusion's San Diego location, Schwab learned a great deal about digital marketing — often while working 18-hour days. Fast forward to the year 2000. Schwab, an eager 26-year-old, was looking for yet another new challenge and Jaguar Land Rover (JLR) had one to tackle. The company wanted to build a vehicle configurator and recruited Schwab to lead the charge. That was just the start of her tenure at JLR, where she held a variety of jobs in marketing and managing regional dealer operation. Over time, with determination and exposure, she rose up the corporate ladder. "I was lucky to spend 15 years there. I moved between virtually every sales and marketing position in the car business, most recently heading global marketing, based out of its headquarters in England," Schwab said. While working at Jaguar Land Rover, a friend and former colleague of Schwab's offered to take her on a tour of the factory located across the street, where he now worked, which happened to be Aston Martin. She accepted the invitation — eager to see the iconic cars still built by hand. During the tour, Schwab was introduced to Andy Palmer, the CEO of Aston Martin. Little did she know, it wasn't a chance encounter. "Suddenly it dawned on me — this is a job interview. Andy offered me the job of president for Aston Martin the Americas, and needless to say, I jumped at the chance. I mean, this is the coolest job in the world." So, what does a typical day look like for the woman who has the "coolest job in the world?" "There's no such thing as a typical day," Schwab, who rises before the sun, said. "I usually set my alarm for 4:45 a.m., because I'm based in Southern California, eight hours behind our UK headquarters. The early wake-up ensures I have a few productive working hours with those colleagues." Schwab's role can best be described as demanding but rewarding. Though driving the cars is a thrilling job perk — shockingly, she says it's not the best part. Instead, it's the people who help her navigate through every obstacle. "My favorite perk is easily the opportunity to impact people’s lives. At Aston Martin, we play and win as a team. I love hearing members of my team say, 'thanks for believing in me' or 'thanks for giving me a chance.'" Together, the team is working to expand Aston Martin’s market share through an ambitious international growth plan, and Schwab is primarily tasked with promoting, marketing, sales and service for the company in the United States, Mexico, Canada and South America. As you might imagine, this requires a lot of travel. When not jet-setting around the globe, Schwab is a dedicated wife and mother. Needless to say, her life is a balancing act — one that she hopes inspires other women in male-dominated industries. "My advice would be, don't be so hard on yourself. I haven’t seen my daughter this week, and while I could dwell on that, I make the most of the time we do have together. I hope that my role helps to pave a path for her, and that someday, she’ll have many more female mentors and leaders to admire throughout her own career." As a woman in the driver's seat, Schwab hopes to break through barriers, not only for her daughter, but for all women around the world. "Support one another. Always remember: there’s space for more than one of us at the top." Photo Credit: Aston Martin. Laura Schwab, president of Aston Martin the Americas, with the DB11.